I had a nice surprise the other week when I was doing a segment on Good Day Central Illinois. I thought the segment was about over when I was told to shut my eyes because there was a surprise for me! Well, I was kind of excited and scared all at the same time. You can see what happened by clicking right here and below is a screen shot from the exciting surprise on live TV! To sum it up in case you didn’t click on the link, Tiffini, who I knew from facecrack but had never met in real life, wanted to surprise me with my very own Little Nut Hut! She said she enjoys reading the blog and felt bad I had been dealing with my spider leg and wanted to do something nice for me. Well that was one of the nicest things anyone’s ever done for me, especially someone I’ve never met before! I wanted Tiffini to be part of setting up the Little Nut Hut at MBIP World Headquarters, so we decided to have lunch, stop at the Nut House to get some nuts to fill the hut up and then have some of the inaugural nuts back at MBIP World Headquarters. And so that’s what we did and you can follow along by scrolling, scrolling, scrolling! 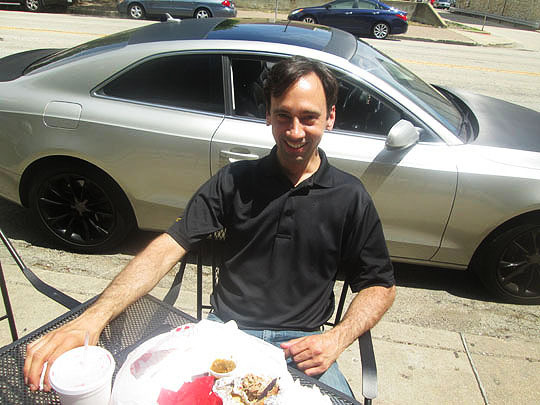 You can get your food to go or you can sit at the outside tables on the sidewalk and when I turned around I saw my friend Chris enjoying his lunch at one of the tables. In addition to being one of the nicest guys in the world, Chris is a musician and plays bass and tuba in 79 local bands and three others in Europe and one in Africa! Just like the Beach Boys, this guy gets around! He was last seen on this blog playing with Super 88 at the Red Barn. He said his lunch was fantastic! It was great to see Chris, but I turned away before he could pull his tuba out, that's always a little awkward. Especially in the daytime! Order at the window! That’s Chef Raul behind the screen, ordering brought back this Midnight Express memory! Minutes after we sat down, the lovely Thalia brought us our lunch, that’s some sweet service! Tiffini got the tacos which are authentic Mexican street-style tacos with seasoned beef, cilantro, onions and a lime wedge. In addition to tacos, burritos, tortas and nachos, they also have four styles of hot dogs and I got the Taco Dog. This is a plump, jumbo hot dog on a bakery fresh bun topped with seasoned ground beef, lettuce, pico de gallo and cheese. Tiffini loved the tacos and my Taco Dog was so delicious. It’s a little tough to eat with your hands, so I surrendered and ate the dog with my knife and fork. It was a hot diggity dog delight! Chef Raul suggested we try the Elote, which is Mexican style grilled corn and it was fantastic! The corn on the cob is grilled and topped with Mexican crema, parmesan cheese and Raul’s special spice blend. It’s rich and spicy and so tasty! Raul took a picture of Tiffini and I enjoying the Elote at our table and then showed us t-shirts they have for sale with the restaurant’s unique and original logo on it. That was such a delicious and fun lunch and I’m definitely coming back to sample more off of the menu! 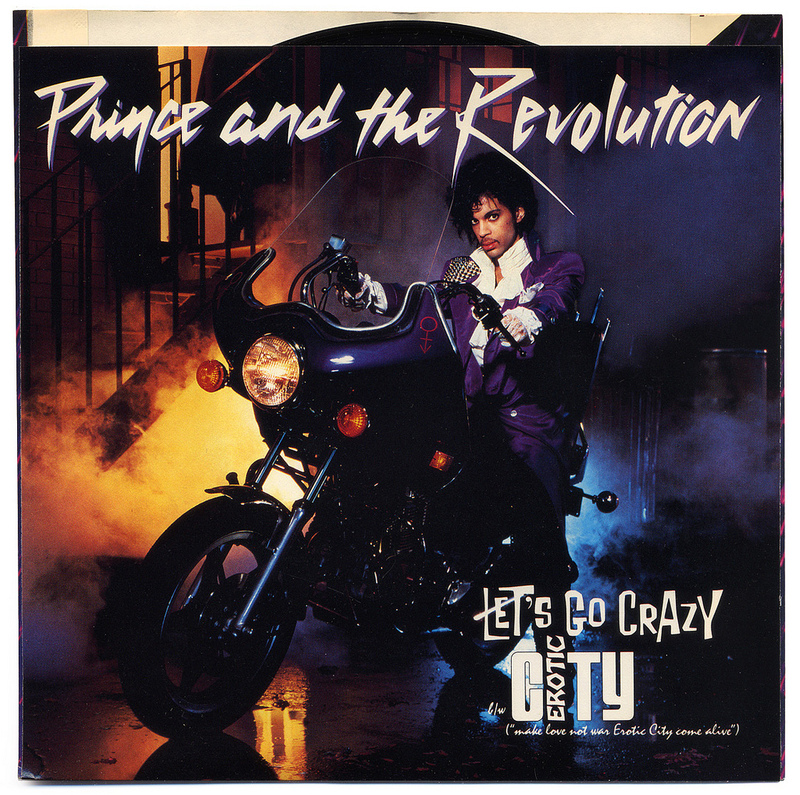 But now it’s time to get a little nuts! 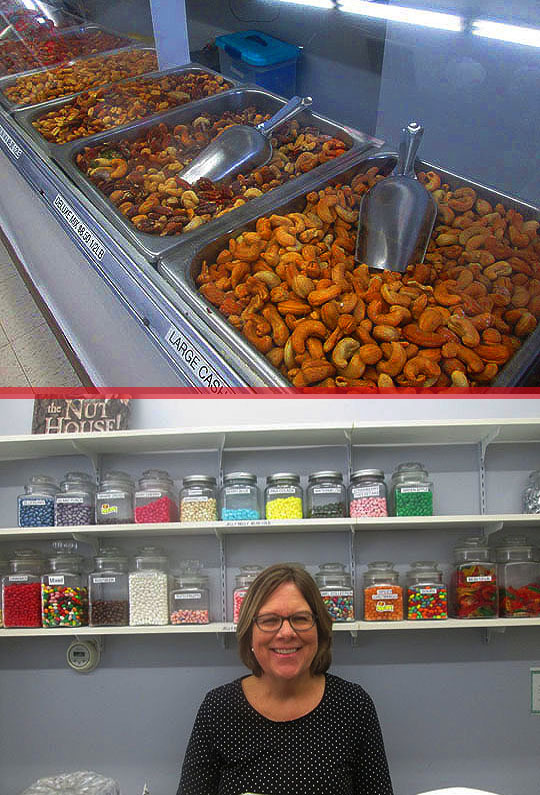 We had to get some nuts to stock up my Little Nut Hut, so we walked down the street to Peoria’s best nut and candy supplier, The Nut House! I last reported on the Nut House last July when Janey Scott bought the place. Nuts! And there’s plenty of them in here! Mary, who’s Janey’s sister served us up a couple of bags and now it’s time to set up my very own Little Nut Hut! It comes all together and ready to go! All we had to do was fill it up with the nuts from the Nut House and turn it on and wait for the nuts to get warm. So while we wait for the nuts to warm up, here’s some nutty music to pass the time with! Okay the nuts should be warm and I took the first pull on the machine. I thought there was a lip there that caught the nuts, but I was wrong and a pile of cashews hit the carpeting! Let’s try this again! 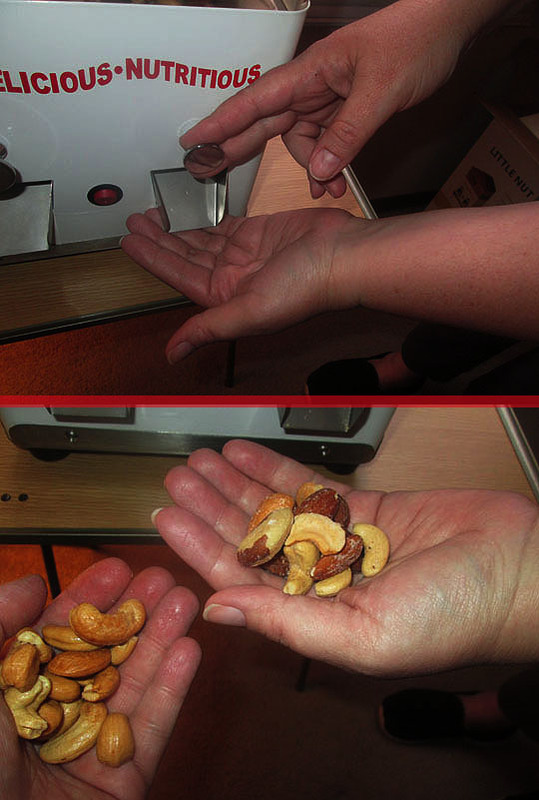 Tiffini showed me how it’s done and there’s the two inaugural fistful of nuts from my own personal Little Nut Hut! Thanks so much to Tiffini for getting this for me and for the thought behind it. That was so nice and I truly appreciate it! If you’d like to have your own Little Nut Hut, go to this link to find out how you can purchase one and it’s a local business! We’ll see you all tomorrow! Related Posts: Little Nut Hut Tour and Draining The Little Nut Hut at the Red Barn.